Found along the 2200 Block of East 5th Street, the ruins of “Old Main” are the remnants of the main building of the original campus of the Duluth Normal School—later the Duluth State Teacher’s College, today the University of Minnesota Duluth. In 1985 the building closed and was vacated, awaiting renovation into apartments. On February 23, 1993, vandals broke into Old Main and set it on fire, completely gutting the building. Except for the three arches of its main entryway, the school was demolished. The arches are now part of Old Main Park. Hoene agrees with fire department officials in suspecting arson as the cause of the fire, which they believe started in the west end of the building at least an hour before it was reported. “It was seriously burning when we got here,” assistant Fire Chief Donald Kivisto said Tuesday. “It was frightening,” said Paul Osterlund, a neighbor who watched as the inferno spewed ashes and burning debris over rooftops and cars for several blocks. Osterlund credited the snow cover with keeping the airborne debris from touching off any more fires. The 31 firefighters, five pumper trucks, two ladder trucks and two rescue units did save three other university buildings on the 7.5-acre campus, including one just 30 feet from the west end of Old Main. Two of the buildings are used for research facilities, while Torrance Hall, a former dormitory, is closed. 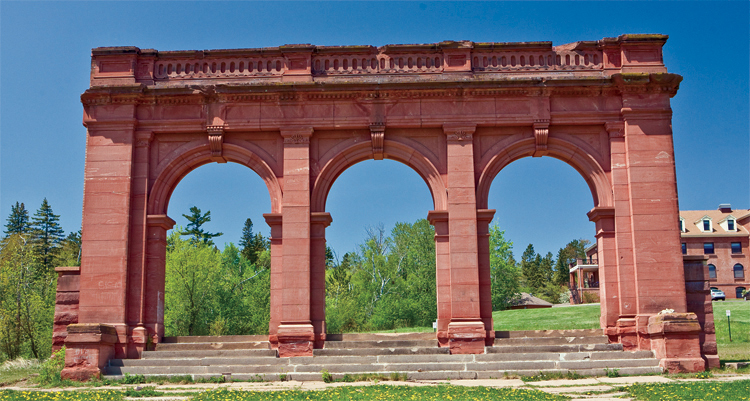 After a few days’ delay, during which city officials tried to find a developer who would make use of Old Main’s still-standing walls, the structure was razed with the exception of several arches, which were preserved and reinforced—and which still stand on the site, which was turned over to the city to become a park. Three men were arrested and pleaded guilty to setting the fire.